The USS YF-415 was built by the American Shipbuilding Company of Buffalo, NY and completed in September of 1943. Though it had been fitted with mine tracks for potential other uses, they had been removed, and the ship functioned primarily as a work lighter. The abbreviation “YF” is a ship classification that stands for “yard freight”. Twin 300 hp Union diesel engines powered the 132’ long vessel, which was designed to carry a cargo of 250 tons, stowed on deck. Operating exclusively in the Boston area, the vessel was manned by a mostly local crew of men based out of the Boston Navy Yard. On May 10, 1944 the YF-415 departed for the Naval Ammunition Depot in Hingham, MA under the command of Chief Boatswain’s Mate Louis B. Tremblay of Marblehead, MA. The ship’s orders were to proceed to Hingham and load ammunition that would be disposed of in deep water off Boston. The YF-415 planned to take on additional crew at Hingham to assist in the disposal of the ordnance. Previously, the ship had made two such excursions to dispose ordnance and these had been uneventful. The ship was loaded with approximately 150 tons of ammunition, which included obsolete pyrotechnics, black powder, and 50-caliber projectiles ranging from 3 – 5” in shell size, among other miscellaneous ordnance. The YF-415 was loaded to its maximum draft, though some claimed the ship was further weighted down to its gunwales. There was no official protocol, other than a pre-departure briefing from an officer with regard to procedures for the safe handling of the ammunition. The YF-415 departed Hingham with five officers, ten men comprising regular crew and an additional work crew of sixteen African-American men from the Hingham ammunition depot for a total of thirty-one men. While underway, the crew prepared the ordnance for disposal, which involved sequestering projectiles from other explosives in anticipation of disposing of the most dangerous material first. At approximately 11:30 am on May 11, the YF-415 arrived in the disposal area where the crew proceeded to dump nearly two-thirds of the cargo, including much of the black powder and projectiles, uneventfully. We started taking the pyrotechnics which were in the containers … and putting projectiles in with them, in the containers and then mashed in the tops so the would stay in, and sink – they wouldn’t otherwise. We had to do this before, that is the only way these pyrotechnics would sink, and it worked before. At no time did any officer, whether at the Hingham Ammunition Depot, or on board the YF-415, inspect the rocket containers to ensure the matches had been removed. At approximately 11:30, the crew began dumping the ordnance. The relatively inexperienced enlisted African-American men from Hingham were charged with disposing the rockets. The disposal process proceeded as planned and without incident. However, according to Chief Boatswain’s Mate Tremblay, who was observing the disposal operation, he later testified that at about 12:30 pm he heard a “terrific whoosh” – a fire from an explosion of rockets, which set off a chain reaction of explosions, quickly engulfing the port side of the ship, spreading from amidships to the entire main deck. The fire aboard the YF-415 raged uncontrollably and attempts to man fire fighting equipment were unsuccessful. Many were temporarily trapped in the crews quarters, located in the forward part of the ship, as intense flames and heat seared the lighter. One crewman, William J. Bradley, though he managed to escape from the engine room, suffered third degree burns over 76% of his body and later died. Most men drowned in the water, awaiting rescue. One sailor, Seaman second-class Yeo Jin was reported to have jumped into a shower during the panic in an attempt to shield himself from the fire on deck. He would not leave the crews quarters despite the efforts of his fellow sailors. They were eventually forced to leave to save themselves. They did not see Jin alive again. At no time did the abandon ship or emergency signal sound, as men began to flee the vessel on their own accord. With little time to don life preservers and rafts, many men simply went into the water, which was 50 degrees Fahrenheit, clinging to debris while waiting up to 45 minutes before they were rescued. Numerous ships and vessels operating in the area were dispatched to conduct search and rescue operations. 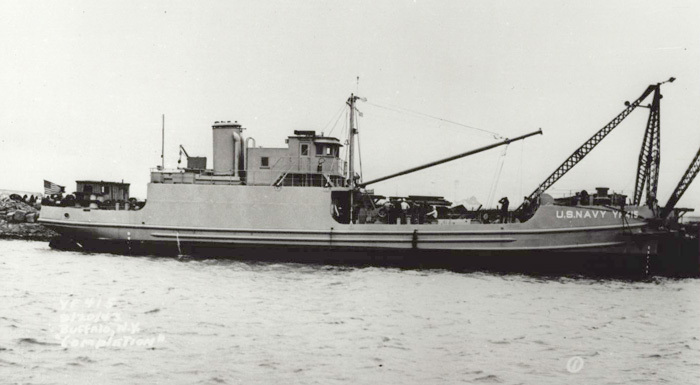 The USS Zircon, a nearby weather-observing vessel, ultimately rescued fourteen survivors, four crewmembers of which one later died from severe burns and ten men from the Hingham contingent. The missing sixteen men’s bodies were never recovered. The Inquiry following the sinking made several recommendations, both with respect to proper protocol and safety measures for disposing ordnance as well as the use of vessels more appropriate for such hazardous activities. In summary, the report recommended that there be made available and posted in visible places standard instructions for draft, trim and deck loading as well as life preserver locations and safety precautions for the handling of dangerous cargo. In addition, it was recognized that a more appropriate vessel should have been used such as a non-self propelled lighter (barge) towed by a tug that could be easily abandoned should an accident occur. The USS YF-415 was located by Bob Foster on November 3, 2002 and first visited by a group of local divers who returned to dive the site on July 20, 2003. This group, which would form the principal exploration team, consisted of divers Jack Ahern, David Caldwell, Donna Chaston, Bob Foster and Heather Knowles.